A gore from one of the greatest globes ever made. New England, the West Indies, Northeastern South America (Unitled Globe Gore). A fine example of Vincenzo Coronelli's extremely rare 1688 globe gore of Eastern America. Covers from Newfoundland south along the New England and Virginia coastlines to the Bahamas (Gigante) and the West Indies, showing parts of Cuba and all of Hispaniola, Porto Rico and the Lesser Antilles, as well as the northern parts of South America from modern day Venezuela to the Orinoco Delta and the Guianas. 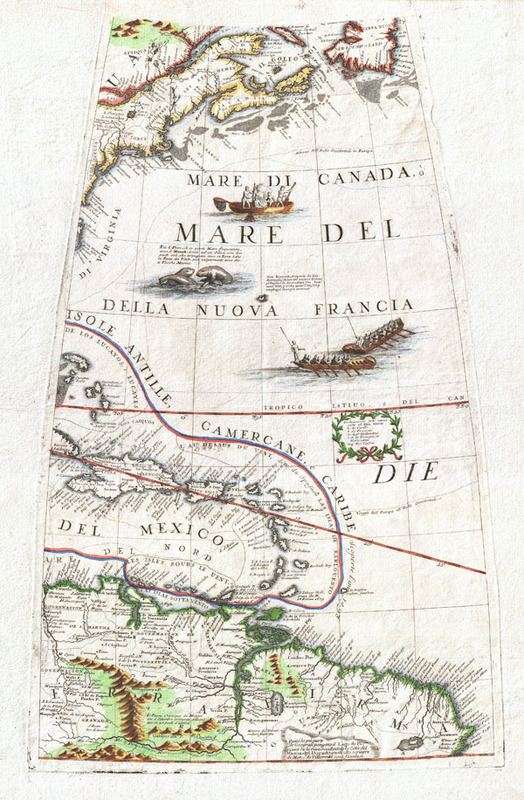 As Royal Cartographer to King Louis XIV of France, Coronelli had access to the most recent cartographic records coming from the New World – particularly form the French occupied territories in North America and the West Indies. Advocating French control of much of North America, Coronelli limits New England (Nuoua Inghilterra) to the regions immediately surrounding Cape Cod and Boston Harbor. Similarly, New York (Nuoua Iorck) is confined to the coastal lands near New York City, Connecticut and Long Island. Though largely supplemented by the British by the time Coronelli drew this map, he recognizes Sweden's claims to New Sweden (Nuoua Suecia) in the vicinity of Delaware Bay. The West Indies are drawn with considerable accuracy with notations for cities, ports, islands, and references to the powers that controlled them. Offers good though somewhat inaccurate detail of South America's mountain and river systems, particularly the Orinoco. Additionally, this map also shows several important sailing routes including both northern and southern routes to Europe. Decorated by several vignettes including cod fishermen off the coast of New England, frolicking Mentees, and two rowboats plying the Atlantic. Also depicts many of the important cod fishing banks between Cape Cod and Newfoundland. This beautiful gore was originally drawn by Coronelli as part of his fantastic 42 inch 'Terresterial Globe.' Several examples of this magnificent globe are prized today by institutional collections in Europe and America. Far rarer are the atlases that Coronelli published from his globe gores. The Libro Dei Globi, published in 1693 and again in 1701, is the first and likely the finest example of a world atlas composed entirely of globe gores. Only seven complete examples of this rare atlas are known to have survived to modern times. Coronelli, Vincento. Libro dei Globi, 1693 edition. Near flawless. Wide clean margins. Orignal pressmark visible. Blank on verso. Wallis, H., Theatrum Orbis Terrarum, series of Atlases in Facimile, Vol. IV, introduction. Boston Public Library, Norman Leventhal Map Center, (call number).